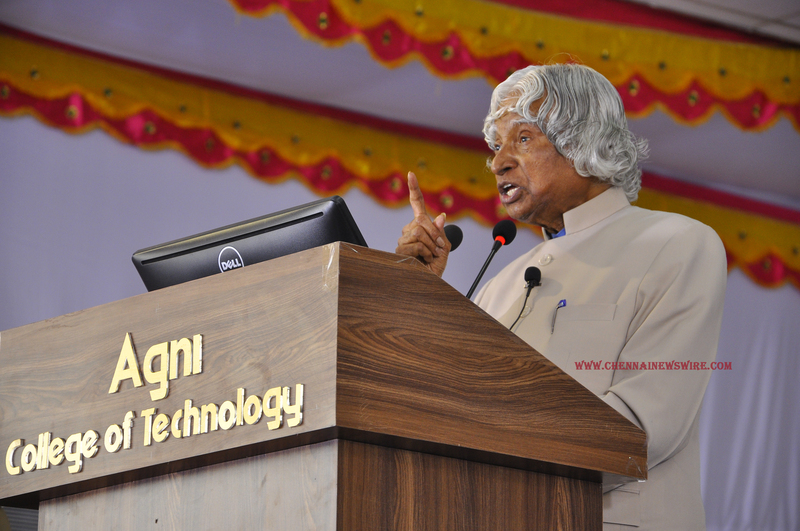 Dr. Kalam hails “Agni’s Ignite 2015” a step towards transforming Indian Science and Research ..
Agni College of Technology, Thalambur, Chennai organized Developed India 2020 summit at the College premises . The event marked the celebration of Agni’s Ignite 2015 Science Project Competition for School Children. His Excellency Bharat Ratna Dr. A.P.J. Abdul Kalam, the Former President of India was the chief guest on the occasion. Addressing a mega gathering of 3000 students from over 200 schools from across Tamil Nadu, young engineers, teachers and academicians, Dr. A.P.J. Abdul Kalam advised students and aspiring young scientists to set their aims high, continuously acquire knowledge and put in hard work and perseverance in all their endeavours. Interacting with the Prize winning students, Dr. Kalam congratulated the winners and urged them to dream big. He said to the student scientists and young innovators during the event to carve a niche for their own and to become unique in ones chosen field. 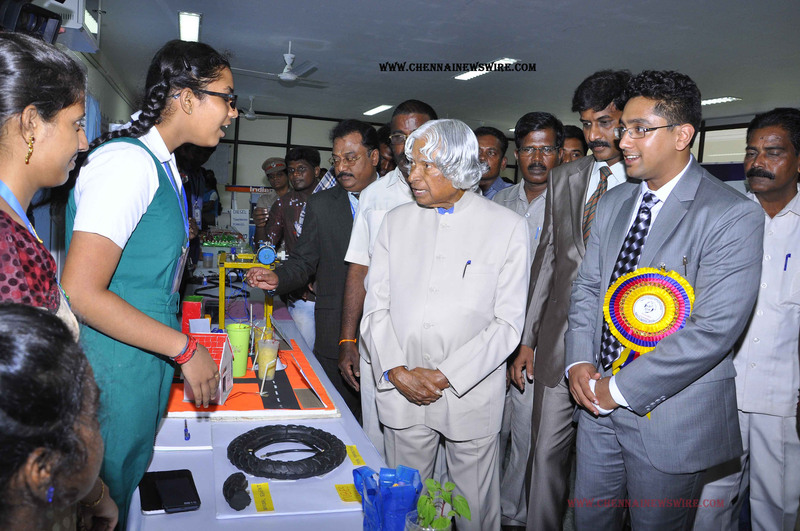 Calling technology the backbone of the nation, Kalam urged the budding young scientists to think for the welfare and development of entire humanity. Inventions and discoveries are from creative minds with constant efforts, the pioneer nuclear scientist said. In a rather brainstorming Q&A session, Dr.Kalam made students themselves come up with the solutions to various issues through interspersed answers with questions of his own, which created a positive vibe among students. “Every youth wants to be unique but the world around you is doing its best to make you mediocre. Parents and teachers constantly compare you to others and ask you to be like them. You have to battle it out so that you reach your destined place of being unique,“ he said. Dr.Kalam expressed his happiness and congratulated the 30 students – The District Level Winners of Agni’s Ignite who had presented their Projects during the day. While observing the Project Exhibition- he praised Agni’s Centre for Research and Development for creating platform for the student community to exhibit their talent through Agni’s Ignite 2015 Science Project competition. 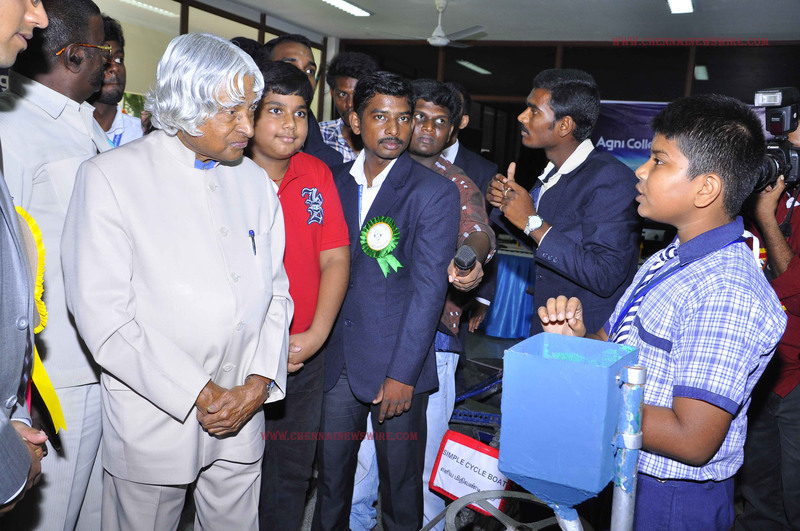 Dr. Kalam appreciated all the projects that have been showcased to him and spent quality time in interacting and motivating the student scientists and in particularly he praised the Simple Cycle Boat of J. Murugan a 9th std young scientist from Madurai District, Saruguvalayapatty Govt.Hr.Sec. School. He also gave his guidance to approach National Water Foundation for funding the project. He emphasized on research as the vital tool for innovation and excellence, and also called educationists, students and industries to take the momentum forward. Dr. Kalam acclaimed the brains behind Agni Ignite 2015, which according to him is the right step at the right time in the right direction towards his Vision 2020 for India. Welcoming the gathering, Mr. J. Agnishwar, Director, Agni CRD traced the genesis behind the Ignite-2015 and declared that Agni’s Ignite drew inspiration from Dr.Kalam and his vision for India, and aims at giving a new perspective to science and research. “AGNI IGNITE 2015” is a mega Science Project Competition for school students held across all 32 districts of Tamil Nadu. 30000 students from over 7000 schools were participated in the competition held in two levels and out of which a handful of 60 brightest participants are selected for the third and final level of reality show titled “Ezham Arivu, where the students will be showcasing their inventions and innovations on a national TV” he said. Mr. Agnishwar, expressed his pleasure that the event has set a new precedent, an amazing feet in converting the youth’s dreams into the thoughts for tomorrow. nology congratulated the prize winners. Dr. S.R.R. Senthil Kumar, Principal, Agni College of Technology proposed the vote of thanks. Kirtanya Krishnamurthy, Founder and CEO, Mind Fresh Training, Dr.T.S. Natarajan, Professor, IIT,Madras and Mr. J. Sujith Kumar, Head HR, Infosys, Chennai also spoke on the occasion.